Cell biology is the study of the cell and its molecular processes. A cell is generally defined as a single unit or compartment, enclosed by a border or wall, which is usually part of a bigger structure. In biological terms, a cell is the smallest living structural and functional unit of organisms. Some organisms, such as bacteria, are unicellular, consisting of a single cell. 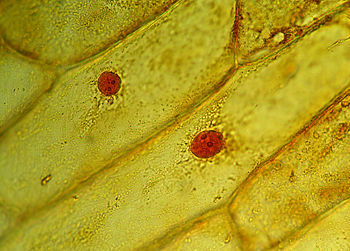 Other organisms, such as humans, are multicellular or have many cells. Humans are composed of an estimated 100 trillion cells and generate somewhere near 1 millions new cells per second Each cell is an amazing world unto itself: it can take in nutrients, convert these nutrients into energy, carry out specialized functions, and reproduce as necessary. Even more amazing is that each cell stores its own set of instructions for carrying out each of these activities. In the early twentieth century, the cell was viewed as essentially a blob of protoplasm (a collection of gelatin molecules) and, although the inner workings were not yet understood, it was assumed that the first cell developed through a process of chemical evolution (abiogenesis). The following is a quote from Ernest Haeckel, who was affectionately known as Darwin's bulldog. On the other hand, 21st century technology reveals that although the tiniest bacterial cells are incredibly small, weighing less than 10-12 grams (or 1 picogram), the entire cell is incredibly integrated and each part works as part of a team. Cell biology illustrates overwhelming evidence of intelligent design; in particular, due to the many irreducibly complex molecular machines. Cells are so tremendously complicated that we are only beginning to understand their internal workings, and indeed many functions within the cell still remain a total mystery. An analogy sometimes used is the comparison of a cell to a city. For instance, the workers can be compared to the protein, the power plant to the mitochondria, the roads to the actin fibres and microtubules, the trucks to the Kinesin and Dynein, the factories to the ribosomes, the library to the nucleic acid, the recycling centre to the Lysosome, the police to the chaperones, and the post office to the golgi apparatus. As technology increases, science continuously opens black boxes within already opened ones and, as more and more of these are being exposed, the phenomenal complexity of the whole system pushes evolutionary theories to breaking point. Comparison of a typical animal cell (eukaryote) and bacterial cell (prokaryote). Cells are identified as one of two broad categories; prokaryote or eukaryote, which have several characteristics in common. All multicellular organisms have eukaryotic cells that take on vastly different roles and form specialized tissues. All prokaryotes are single-celled organisms (bacteria). In addition, every sexually reproducing organism begins life as a single cell, sewn together by the bonding of the male sperm with the female egg. This cell contains the digital code necessary for the formation of other cells to perform the many functions of the body. These include our taste buds, fat cells, skin cells, blood cells and many more. Three basic categories of cells make up the mammalian body: germ cells, somatic cells, and stem cells. Each of the approximately 100,000,000,000,000 cells in an adult human has its own copy, or copies, of the genome, with the only exception being certain cell types that lack nuclei in their fully differentiated state, such as red blood cells. The majority of these cells are diploid, or have two copies of each chromosome. These cells are called somatic cells. This category of cells includes most of the cells that make up our body, such as skin and muscle cells. Germ line cells are any line of cells that give rise to gametes—eggs and sperm—and are continuous through the generations. 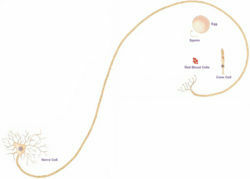 Stem cells, on the other hand, have the ability to divide for indefinite periods and to give rise to specialized cells. Eukaryotes include fungi, animals, and plants as well as some unicellular organisms (protists). Eukaryotic cells are about 10 times the size of a prokaryote and can be as much as 1000 times greater in volume. The major and extremely significant difference between prokaryotes and eukaryotes is that eukaryotic cells contain membrane-bound compartments in which specific metabolic activities take place. Most important among these is the presence of a nucleus, a membrane-delineated compartment that houses the eukaryotic cell’s DNA. It is this nucleus that gives the eukaryote (literally, "good nut" or "good kernel") its name. Eukaryotic organisms also have other specialized structures, called organelles, which are small structures within cells that perform dedicated functions. As the name implies, you can think of organelles as small organs. 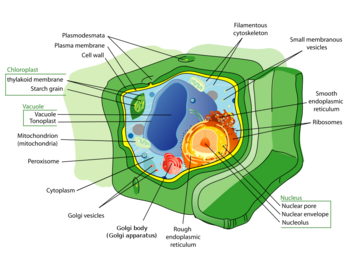 There are a dozen different types of organelles commonly found in eukaryotic cells. Bacteria are prokaryotes, which differ from eukaryotes in that their DNA is not organized inside a nucleus. Prokaryotes also have only one chromosome, which is circular instead of linear. Although Prokaryotic cells are sometimes called "simple cells", they perform most of the same metabolic processes as eukaryotic cells. Many of these reactions are simply not sequestered inside organelles. For example, both prokaryotes and eukaryotes perform photosynthesis and cellular respiration, but only eukaryotes have chloroplasts and mitochondria respectively. All cells are surrounded by a membrane that is composed of a double layer (bilayer) of phospholipids. 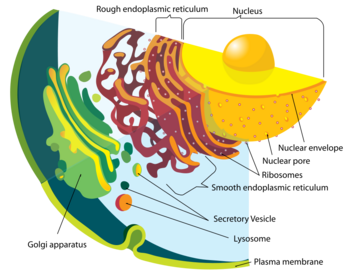 Inside this plasma membrane is the cytoplasm that consists of a fluid called the protoplasm, and contains one or more organelles depending on the cell type. The protoplasm is composed of about 65% water and contains about a billion dissolved molecules per cell. The water provides a favorable environment for the thousands of biochemical reactions that take place inside the cell. Cytoplasm - Cytoplasm is the jellylike mass that constitutes most of the volume of the cell. 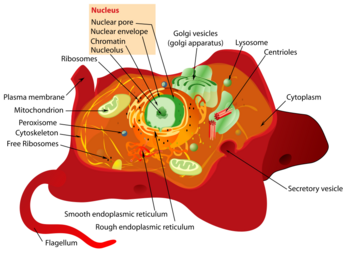 It surrounds the nucleus and contains the organelles. It contains dissolved nutrients, helps break down waste products, and moves material around the cell through a process called cytoplasmic streaming. Cytoskeleton - The cytoskeleton is an important, complex, and dynamic cell component. It acts to organize and maintain the cell's shape; anchors organelles in place; helps during endocytosis, the uptake of external materials by a cell; and moves parts of the cell in processes of growth and motility. There are a great number of proteins associated with the cytoskeleton, each controlling a cell’s structure by directing, bundling, and aligning filaments. Plasma membrane - The outer lining of a eukaryotic cell is called the plasma membrane. This membrane serves to separate and protect a cell from its surrounding environment and is made mostly from a double layer of proteins and lipids, fat-like molecules. Embedded within this membrane are a variety of other molecules that act as channels and pumps, moving different molecules into and out of the cell. A form of plasma membrane is also found in prokaryotes, but in this organism it is usually referred to as the cell membrane. Nucleic acid - Two different kinds of genetic material exist: deoxyribonucleic acid (DNA) and ribonucleic acid (RNA). Most organisms are made of DNA, but a few viruses have RNA as their genetic material. The biological information contained in an organism is encoded in its DNA or RNA sequence. Prokaryotic genetic material is organized in a simple circular structure that rests in the cytoplasm. Eukaryotic genetic material is organized in a more complex structure. Lysosome - performs cellular digestion. Lysosomes and peroxisomes are often referred to as the garbage disposal system of a cell. Both organelles are somewhat spherical, bound by a single membrane, and rich in digestive enzymes, naturally occurring proteins that speed up biochemical processes. For example, lysosomes can contain more than three dozen enzymes for degrading proteins, nucleic acids, and certain sugars called polysaccharides. All of these enzymes work best at a low pH, reducing the risk that these enzymes will digest their own cell, should they somehow escape from the lysosome. Here we can see the importance behind compartmentalization of the eukaryotic cell. The cell could not house such destructive enzymes if they were not contained in a membrane-bound system. Multicellular organisms possess numerous genetically customized cells that perform unique jobs in the body. Shown are the red blood cells, Nerve cells, human egg cell, sperm cell, and cone cell of the eye. ↑ Bolsover, Stephen R.; Hyams, Jeremy S.; Shephard, Elizabeth A.; White, Hugh A.; Wiedemann, Claudia G (2004). Cell Biology. Hoboken, New Jersey: John Wiley & Sons. p. 1. ISBN 0-471-26393-1. ↑ How many cells does a human lose every second? by Steve Mack. MadSci Network. ↑ Stansfield, William D.; Colomé, Jaime S.; Cano, Raúl J. Molecular and Cell Biology. New York: McGraw-Hill. p. 2. ISBN 0-07-139881-3. ↑ Freedman, Jeffrey C. "4:Cell Membranes and Model Membranes". In Sperelakis, Nicholas. Cell Physiology Sourcebook:A Molecular Approach (3rd ed.). San Diego, California: Academic Press. p. 65-67. ISBN 0-12-656977-0. This page was last modified on 9 August 2014, at 22:10.